استفاده از کامپوزیت‌های کربن/اپوکسی در اکثر سازه‌ها به دلیل نسبت استحکام به وزن قابل توجه، روشی متداول است. در این رابطه بررسی و دسته بندی انواع خرابی‌ها در سازه‌های کامپوزیتی برای جلوگیری از هرگونه اتفاقات احتمالی و افزایش قابلیت اطمینان آن‏ها، امری ضروری است. در یک دسته بندی کلی، خرابی‌های سازه‏های کامپوزیتی را می‌‌توان به چهار نوع تقسیم نمود: ترک ماتریسی، شکست الیاف، جدایش الیاف از ماتریس و جدایش لایه‌ای. یکی از روش‌های جدید تشخیص عیوب در کامپوزیت‌ها، استفاده از روش انتشار صوت است. بر این اساس، هدف از این مقاله بررسی و دسته بندی انواع مختلف ساز و کار‌های خرابی در نمونه‌های کامپوزیتی چندلایه سوراخدار، تحت بار کششی با استفاده از روش انتشار صوت است. نخست یک قطعة کامپوزیتی سوراخدار بر اساس استاندارد ASME تحت بارگذاری کششی قرار گرفت. موج‌های الاستیک انتشاریافته حاصل از شکست قطعه توسط دو حسگر انتشار صوت از نوع نوار پهن ثبت شدند. برای تشخیص مقدار درصد خرابی از دو روش تبدیل موجک بسته‌ای و خوشه‌بندی فازی استفاده شد. نتایج این دو روش با تحلیل تصاویر حاصل از میکروسکوپ الکترونی روبشی مقایسه گردیدند. نتایج نشان داد که حدود 50% خرابی‌ها مربوط به جدایش الیاف از ماتریس بوده، حدود 30% از ترک ماتریسی ناشی شده و حدود 20% در ارتباط با شکست الیاف می باشد. همچنین بیشترین اختلاف در این دو روش در تشخیص خرابی‌ها 7% می‌باشد. نتایج بدست آمده از این پژوهش نشان دهنده بازدهی مطلوب روش انتشار صوت در تعیین نوع خرابی‌ها و مقدار درصد هریک از آن‌ها در کامپوزیت‌های چندلایه است. 3- Faculty of Mechanical and Energy Engineering, Shahid Beheshti University, A.C., Tehran, Iran. Carbon/epoxy composites have been used frequently in several structures due to their incredible ratio of strengths to weights. In this regard, investigation and classification of damages in composite structures are essential to prevent any probable happenings and to enhance the reliability. Such failures can be generally categorized into 4 groups, including matrix cracking, fiber breakage, debonding of fibers from the matrix, and the delamination. One of the new methods for detection of defects in composites is to utilize the acoustic emission approach. Accordingly, the aim of this article is to investigate and classify the different types of failure mechanisms in open-hole laminate composite specimens under tensile loading using acoustic emission. First, an open-hole specimen was examined under tensile loading based on ASME standards. Then, elastic waves due to failures in the specimen were recorded by wide-band acoustic emission sensors. Two methods have been utilized to detect the failure percent, including Pocket wavelet transform and Fuzzy clustering approaches. Results from these methods were compared to micro-structure images by the scanning electron microscopy. Results showed that about 50% of damages corresponds to debonding, about 30% comes from matrix cracking, and 20% is relevant to fiber breakage. In addition, the difference between two considered methods was 7%. Obtained results in this research indicated the appropriate efficiency of the acoustic emission approach to detect the type of failures and their percent in laminate composites. Grosse, C. U. and Masayasu. O., "Acoustic Emission Testing" Springer, pp. 9, 2008. Michalcova, L. and Martin, K., "Crack Growth Monitoring of CFRP Composites Loaded in Different Environmental Conditions Using Acoustic Emission Method" Procedia Engineering, Vol. 114, pp. 86-93, 2015. Saeedifar, M. Fotouhi, M. Ahmadi, M. and Hosseini Toudeshky, H., "Prediction of Delamination Growth in Laminated Composites Using Acoustic Emission and Cohesive Zone Modeling Techniques" Composite Structures, Vol. 124, pp. 120-127, 2015. Woo, S. C. Choi, N. S., "Analysis of Fracture Process in Single-Edge-Notched Laminated Composites Based on the High Amplitude Acoustic Emission Events" Composites Science and Technology, Vol. 67, pp. 1451-1458, 2007. Fotouhi, M. Heydari, H. Ahmadi, M. and Pashmforoush, F., "Characterization of Composite Materials Damage Under Quasi-Static Three-Point Bending Test Using Wavelet and Fuzzy C-means Clustering" Journal of Composite Materials, Vol. 46, pp. 1795-1808, 2012. 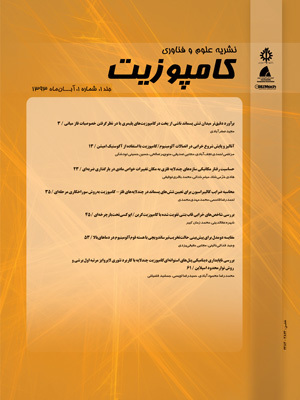 Pashmforoush, F. Fotouhi, M. and Ahmadi, M., "Damage Characterization of Glass/Epoxy Composite Under Three-Point Bending Test Using Acoustic Emission Technique"Journal of Materials Engineering and Performance, Vol. 21, No. 7, pp. 1380-1390, 2012. Saidane, E. H. Scida, D. Assarar, M. and Ayad, R., "Damag Mechanisms Assessment of Hybrid Flax-Glass Fiber Composites Using Acoustic Emission" Composite Structures, Vol. 175, pp. 1-11, 2017. Bourchak, M. Khan, A. Badr, S. A. Harasani, W., "Acoustic Emission Characterization of Matrix Damage Initiation in Woven CFRP Composites" Material Science and Applications,Vol. 4, pp. 509-515, 2013. Laffan, M. J. Pinho, S. T. Robinson, P. Iannucci, L. McMillan, A. J., "Measurement of The Fracture Toughness Associated with the Longitudinal Fiber Compressive Failure Mode of Laminated Composites" Composites Part A: Applied Science and Manufacturing, Vol. 43, pp. 1930-1938, 2012. Njuhovic, E. Brau, M. Wolff-Fabris, F. Starzynski, K. Altstadt, V. "Identification of Failure Mechanisms of Metallized Glass Fiber Reinforced Composites Under Tensile Loading Using Acoustic Emission Analysis" Composites Part B: Applied Science and Manufacturing, Vol. 81, pp. 1-13, 2015. Beattie, A. G., "Acoustic Emission, Principles and Instrumentation" Journal of Acoustic Emission, Vol. 2, pp.95-128, 1983. ISO 12716, Non-Destructive Testing - Acoustic Emission Inspection - Vocabulary, 1998. ASTM D5766/D5766M-11. Standard Test Method for Open-Hole Strength of Polymer Matrix Composite Laminates. ASTM International, West Conshohocken, PA, 2011. ASTM E976–10. Standard Guide for Determining the Reproducibility of Acoustic Emission Sensor Response. ASTM International, West Conshohocken, PA, 2010. Walnat D. F., "An Introduction to Wavelet Analysis" Birkhauser Boston, pp. 350, 2002. Fotuohi, M. Sadeghi, S. Jalalvand, M. and Ahmadi, M., "Analysis of the Damage Mechanisms in Mixed-Mode Delamination of Laminated Composites Using Acoustic Emission Data Clustering" Journal of Thermoplastic Matrix Composite Materials, Vol. 30, No. 3, pp. 318-340, 2017. Bezdek, J. C., "Pattern Recognition with Fuzzy Objective Function Algorithms" Plenum Press, New York and London, 1939. Omkar, S. N. Suresh, S. Raghavendra, T. R. Mani, V., "Acoustic Emission Signal Classification Using Fuzzy C-means Clustering" Proceedings of the 9th international conference on neural Information Processing (ICONIP02), vol. 4, Singapore, IEEE, pp. 1827–31, 2002. Oskouei, A. R. Heydari, H. Ahmadi, M. and Farajpur, M., "Unsupervised Acoustic Emission Data Clustering for the Analysis of Damage Mechanisms in Glass/Polyester Composites" Materials and Design, Vol. 37, pp. 416-422, 2012. Marec, A. Thomas, J. H. Guerjouma, R. E., "Damage Characterization Polymer-based Composite Materials: Multivariable Analysis and Wavelet Transform for Clustering Acoustic Emission Data" Mechanical Systems and Signal Processing, Vol. 22, No. 6, pp.1441–1464, 2008. Mohammadi, R. Najfabadi, M. A. Saeedifar, M. Yousefi, J.
Minak, G., "Correlation of Acoustic Emission with Finite Element Predicted Damages in Open-Hole Tensile Laminated Composites" Composites Part B: Engineering, Vol. 108, pp. 144-152, 2017. Fotouhi, M. Ahmadi, M., "Investigation of the Mixed-Mode Delamination in Polymer-Matrix Composites Using Acoustic Emission Technique" Journal of Reinforce Plastic Composite, Vol. 33, pp. 1767–82, 2014.
 de Groot, P. J. Wijnen, P. A. M. Janssen, R. B. F., "Real-Time Frequency Determination of Acoustic Emission for Different Fracture Mechanisms in Carbon/Epoxy Composites" Composites Science and Technology, Vol. 55, pp. 405–412, 1995.